This is one hour of credit for online user support for the Mining Software Supervisor. Please read the product description or contact us fur more information. How can I get online user support? Once you buy one or more hours of credit of online user support for the mining software Supervisor, we will contact you to schedule a support session. If you have any question you can call us on 1-604-441-6404 and we will help you as soon as possible. What is included in this support? 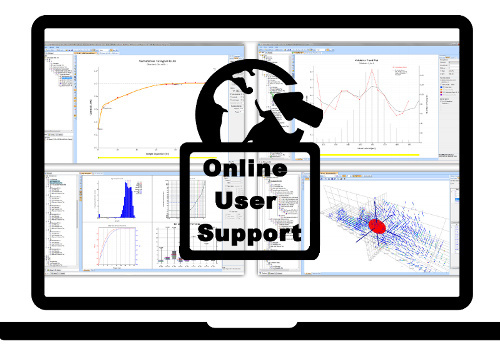 As part of the user support, we will explain technical aspects of the software functionality such as how to build a variogram, how to validate your block model, how to export variograms and any other tool implemented in the latest version of Supervisor. What is NOT included in this support? We don’t provide software support on bugs, license issues, or similar topics. For this type of support you may contact Snowden Support. Is the support only about the software or does it also include general concepts such as geostatistics? Yes, the support includes general concepts and Q&As about geostatistics and how are implemented in Supervisor. Its is basically an online training with Supervisor. Can I use my own data? Yes, you can use your own data. If you prefer we can provide you with a training dataset. This is ideal if you want to learn general aspects of variography or any other tool implemented in Supervisor and your own data is not appropriated for training this. Important: This is not consulting, we will show you how to do the work but we will not do the work for you. Do I need Supervisor in my PC? Yes, you need Supervisor because we want to see your screen and guide you on how to use it. In parallel, we will have our Supervisor opened on our screen in order to provide you with more explanations and demonstrations. What technology will you use to see my screen? We will use WebEx. With WebEx we can see each other’s screens and we can do annotations on your screen (lines, text , highlights). You need a microphone and speakers (integrated or external) to communicate with us. What if there technical problems and I can’t get the service? The 100% will be refunded, if the technical problem is in our side. In addition, we can reschedule the online training. Can I cancel the online support session? Can I reschedule the online support session? What if I use only 15 min of my credit? We discount the credit per 30 min intervals, for example, if you have 2 h credits and we provide 15 min of online support your balance will be updated to 1:30 h.
We will send you an email with the current balance, every time the valance changes. This online user support is designed by Opengeostat Consulting, with approval of Snowden Mining (Training Division). The image of this product was based on Icons made by Freepik from www.flaticon.comand is licensed by CC BY 3.0.